Quite easy to picture the young kids trotting their stuff around this arena. It was a complete wreck, but there were a few details still left to be enjoyed. I was particularly mesmerised by the plastic chairs in various states of decay and vandalism. Fantastic views over to a power station accross the estuary. This huge beast sits roasting in the middle of one of the Spanish Islands. Used to have big wild cabaret shows. Shame I can’t fine photos of it when it was in action. Nice big open space with some very nice street art. Obviously a base station for homeless and junkies. Someone got murdered insde here over a dispute a couple of yeara back. So I kept my eyes about me. "El Gallego" was dead. He'd been killed, so the Guardia were to reveal. A brother and sister, also "residents" of the ruin, face a homicide charge. In the building where Julio Iglesias had once performed, the dance had stopped for the Galician. This was an interesting little caper. A quick walk over in a local park whilst waiting for my car key to be coded and I spot this little derelict sports pavilion. Of course, I had no choice but to climb the Heras fencing and get through a broken window. It was fairly dull with empty changing room after empty changing room. Most of these places have one stand out feature and this one was walking around the corner to spot this at the end of the corridor. Birds were flapping about as I turned the corner making it feel very alive. I had a huge fright and my imagination went from naked squatters, to dismembered murder victim. Quickly I worked out what it was though and with a racing heart, I got on to enjoy the photogenic scene. Another dismembered body was around the corner in one of the rooms but I was prepared this time. This was a chance find on my recent trip to Wales. It was pitch black inside and so I had to quickly learn my dark photography skills. There was some good stuff inside, including a bunch of nicely vandalised slot machines. Quite striking in the torchlight. Lots of nice bowling shoes, but none seem to fit me. Looks like the kids have so much fun in here-Beer cans and paint cans mixed up, empty sudafed packets and a make-shift football court. Very striking colours. This one was exceedingly fetid. The lower area was very dank and burnt out but so dark that I didn’t get a decent photo. I adored the rows of scarlet covered chairs. I real didn’t press the shutter button enough in here. 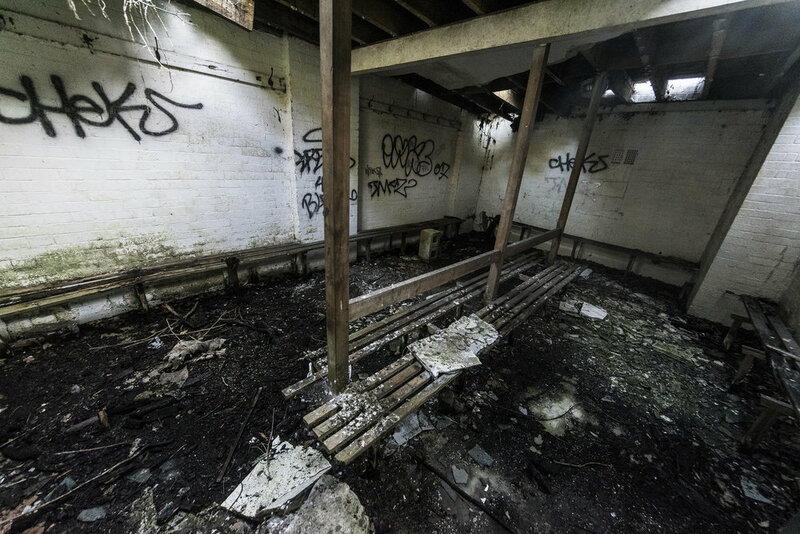 Got loads of little folders of pics of dereliction that I visited whilst out and about that are not as exciting as some of my bigger adventures. I’ll post a few of them up anyway. This place was trashed but surprisingly eerie. The third picture shows a room full of junk and I’m positive to this day that at the back there there is an armchair with someone sitting in it. I have played around with my photos trying to enhance the area but its too grainy. Dead or alive. It was very dark in there and so I didn’t probe and simply moved on, keeping an eye on my back. I actually spotted this place with its trash spewed around the outside from the airplane coming back off my sunny hols. I also became obsessed with the old Mercedes and watched it over a few months slowly decay. I really like how this ugly prefab building sat in its isolated and distant spot away from the main action over at the asylum. I can picture the staff leaving through the main security/gate and then piling into here for cheap frivolity and snooker, de-stressing before going home, only to come back on campus the next day.